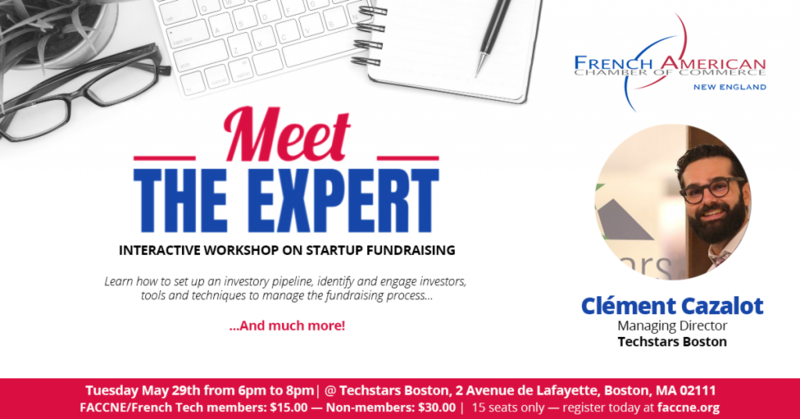 Clément Cazalot, Managing Director of Techstars Boston, will share experiences learned through his journey with founders during an interactive workshop on fundraising for startups. This Meet the Expert event will give entrepreneurs the tools necessary to effectively run a fundraising process. Topics will include building an Investor piperline, raising capital as a pre-Series A company, and much more! Please send us your questions if you want them answered. Clément Cazalot is an entrepreneur, angel investor, and startup advisor, now focusing on working and advising early stage startup. Cazalot is currently Managing Director of Techstars Boston, leading the expansion of one of the most prestigious, impactful and founder-friendly startup accelerator and early stage investor in the world. Previously he served as VP Technology at Intralinks (NYSE: IL), until its acquisition by Synchronoss (NASDAQ: SNCR). The company is part of the top 10 largest SaaS companies in the document management space. Before Intralinks, Cazalot was the co-founder and CEO of docTrackr (accelerated by TechStars Boston in 2012) that was acquired by Intralinks in 2014, after having partnered with industry leaders including Microsoft, Adobe, Autodesk, and Box. He built the company from its inception in the south of France, until the point where their technology was deployed to 99% of the Fortune 1000 in the US, four years later.